Photos courtesy of Courtney Apple Photography. Mondays Without Meat logo design courtesy of Sevag Creative Agency. White Dog Wayne is resourcing its local farms for fresh, seasonal items to include in its exciting Mondays Without Meat menu options. Beginning Monday, July 11th, AroundMainLine.com’s Mondays Without Meat encourages vegetarian options at local restaurants around the Main Line. Eight restaurants are participating and will be offering diner specials each of the four Mondays—through August 1st—focusing on new or prix fixe vegetarian appetizers and entrees. It’s the perfect time of year to embrace the seasonal fruits and vegetables that our chefs across the region can resource. In addition, we are highlighting restaurants that have a special vested interest in their vegetarian customers. We encourage you to make reservations for Mondays Without Meat this week. The full list of restaurants is below with many offering menu details. In addition, we will be updating AroundMainLine.com’s Facebook page as we receive restaurant information. A very sincere thanks to our fantastic participants and we hope you enjoy the inaugural Mondays Without Meat. Restaurants may be offering additional or different options depending on the popularity of dishes. Sample menus are subject to availability. Naan or Whole Wheat Roti. « Food Bites: Beet It! 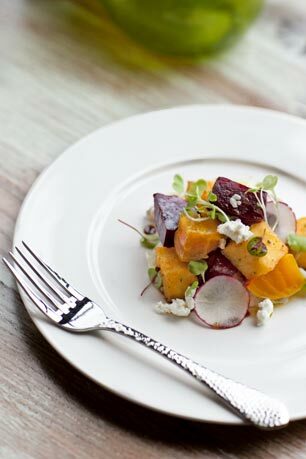 I just went to white dog in wayne on Monday night and had the beet salad, it was amazing!!! Striped Bass was to die for!!! Great restaurant..